This barn loft setting is in Marshall Missouri, at a barn where a pair of turkey vultures have successfully raised a hatch in each of the last three years. They have actually been returning to this loft for more years prior to the last three, however photo documentation has been accomplished only in the last three years (photos by John Carton may be viewed at http://www.flickr.com/photos/johncarton/). Encouraged by the Missouri Department of Conservation to share information with Bob Anderson, director of the Iowa based Raptor Resource Project, the owner did so. Following a short planning process, a resolve was made by the Raptor Resource Project to establish this site as the “first ever live cam for nesting turkey vultures”. In late Fall 2011, the camera and computer monitoring equipment was installed at the site by Bob Anderson himself, with John Carton and the owner assisting. A professional electrician and neighbor on this street in Marshall volunteered all of the necessary trenching and installation of the conduit and electrical wiring. 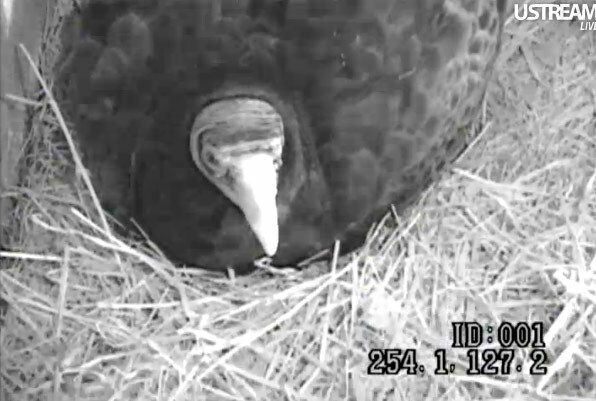 The first returning turkey vultures to this live cam site were observed on April 1st. Initially several adult vultures visited the loft. Individual mature adult vultures look very much alike, so it is not possible for us to distinguish how many different individuals actually visited. On several occasions three birds were present together, and viewers reported seeing four on at least one occasion. At no time were four positively identified by a contemporary camera panning. While the physical appearance of adult male and female turkey vultures is apparently not differentiated, we are able to distinguish between the parents of this mated pair by a dark horizontal line extending across the brow of the male bird from the top of one eye to the top of the other. We know by deduction that this “distinguished eyebrow” bird is the male, only because we actively observed the egg laying by the other via this live cam. We presume this eyebrow marking is an individual difference rather than a gender distinction, however more observations of other birds is necessary. Dad Turkey Vulture. Note the brow ridge. 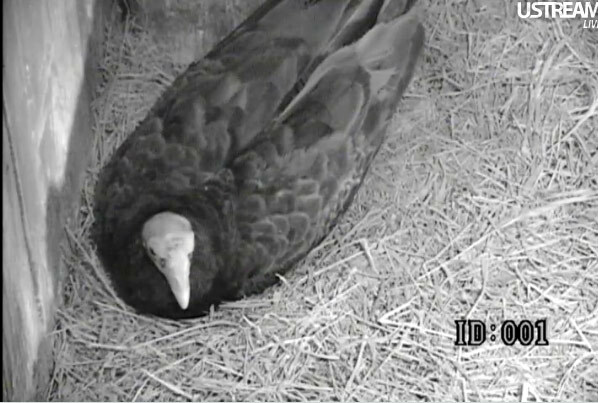 Mom Turkey Vulture. Her head is smoother. On each visit to the loft, the individual vultures walked about the loft floor, each time apparently locating the straw mat area that would later become their nesting spot. While there, each repeatedly pecked at any objects on the floor mat, and repeatedly picked up and snapped into pieces the various lengths of straw. Each bird also displayed a “nest forming” behavior by squatting down on the floor litter and turning circles to create a depression. While each accomplished this behavior individually, there were several occasions when both birds were present at the same time, displaying the “nest turning” behaviors side by side. If this was in fact an interactional behavior (rather than just a parallel behavior) I had the distinct impression that it represented a relationship patterning behavior preparatory to the upcoming egg-laying and incubation periods when both parents would be called upon to tend the nest for extended relief periods (future live cam observations of the pre-egg laying period will be needed to confirm or revise this impression). Reference source cites incubation period of 38-41 days. My observations in prior years at this Marshall Missouri site was more like 30 to 35 days. This year’s web cam documented 1st egg laid on May 9, 2012 with 2nd egg following about May 12th. Generally, adult vulture gender differentiation appears to be minimal. A. Incubation related behaviors: reference source cites both parents incubate the eggs. Live cam observations confirm same. Noting that actual time measurements have not been laboriously taken, neither parent appears to pend greater or lesser time sitting on the eggs, or taking longer breaks. B. Chick feeding related behaviors: reference source cites both parents feed the hungry chicks with regurgitated food. Periodically both adult birds have displayed rapid side to side head movements, as if a reflex movement. At times the head shakes have been as rapid as perhaps 5-6 per second, causing some viewers to speculate they were being bothered by insects or perhaps mites in their ears. Other times the head shakes have been slower frequency, one or two movements at a time, separated by several seconds between “shakes”. Occasionally in conjunction with the side-by-side head movements the adult bird has abruptly struck its beak against an adjoining wall, making a resounding “clunk” sound. I have wondered whether these characteristic head movements may have the function of clearing it’s nostrils for detection of new scents to detect potential presence of danger. When potential danger is detected, as by a sudden outside noise, the bird’s head is thrust up and it is not clear whether the side-to-side head movements accelerate at those times. More observations are warranted. As noted above, both parents share in incubating the eggs, acting in shifts and rarely if ever both present in the loft at the same time. Typically one bird leaves alone, and later either that bird or its mate returns. The unattended time period for the eggs has generally been for as much as 20 minutes to an hour. On only one occasion, after the first egg was laid and before the second, was the egg left unattended overnight. At each separation and return to the eggs, the attending parent gently turns the eggs with its beak. The method typically includes a positioning of the feet under the eggs, while extending the beak over the eggs and nudging them one at a time between the toes and on top of the feet. In the process of egg repositioning, the adult bird often moves its entire body in a rotating motion over the eggs, sometimes half a circle and sometimes completely, carefully turning and nudging each egg along using the side of its beak. This egg positioning takes place in a very deliberate unhurried manner, completed as the parent resumes sitting with the eggs nestling snugly infolded under its breast and crop area. There is no apparent gender differentiation in the egg tending behaviors between the parent birds. From the time of the vultures return to this loft, the adult birds have displayed a very minimum of physical interactions with one another. From their April 1st through the first week of May the two primary birds (that became identified as the mated pair) generally arrived individually at the loft, their arrival times ranging from as little as five minutes to as much as a half hour from one another. On other occasions one would arrive alone, remain a while and leave without our seeing the other. On nunerous occasions a third bird that some viewers came to call “limpy”, because of an apparent limping walk, was present with the primary pair. This caused speculation that “Limpy” might be an offspring of the primary pair that has still nit completely separated from them. That of course is only speculation at this time, however interesting as a possibility. In general the adult vultures presented themselves as highly independent and not inclined to any physical contact with one another. Their apparent wariness to allow any physical closeness seemed to wane after a few weeks visiting the loft, at which time they agreeably stood side by side occasionally touching at the shoulders, peering out the loft window, until one would abruptly fly off leaving the other to sit there perhaps five minutes or so before it too would leave. At no time was any actual breeding behavior observed at the nesting site. As they sat at the windows and walked about the loft floor there appeared to be some pattern of pursuit on the part of one toward the other, with a not-so-determined returned rejection by the other (viewers were inclined to dub the pursuer as the male, and the rejecting interest as the female, but the cues were always very subtle and physical appearance of male and female is very similar). While both parents have tended the eggs in a similar manner, they have done so entirely independently from one another. At no time since the eggs appeared have both birds been observed in the loft at the same time, and the third bird called “Limpy” has not been present at any time. There has been absolutely no reciprocal adult bird behaviors during this time, such as one bird bringing food to the sitting bird. The sitting bird has left at intervals, which is presumed to find food for itself, and to defecate (since there is little if any sign of defecation inside the loft or around the nesting area). Rarely, if at any time has the other parent been present at the loft at the time the sitting bird requires a break. None-the-less, within 15 - 30 minutes of a sitting bird’s departure from the eggs, either that same bird or its mate arrives to resume the sitting (again without any observed interaction with one another).